Back to the mittens. The pattern is by Drops Design and the yarn is probably not much younger than me. It’s my grandmother’s old stash and it’s by Finnish Novita, called Brunners Polka. I’ve not managed to find out anything at all about this yarn but my guess is that it’s from the early 80’s, possibly older. Weird thing is that the yarn label is in blue and yellow (Swedish colours) and it has on it, in my opinion, a very Swedish looking image of a couple in national dress. Also, all text is in Swedish only. And yet, Novita is a Finnish company. Perhaps those days they had a range just for the Swedish market, who knows. 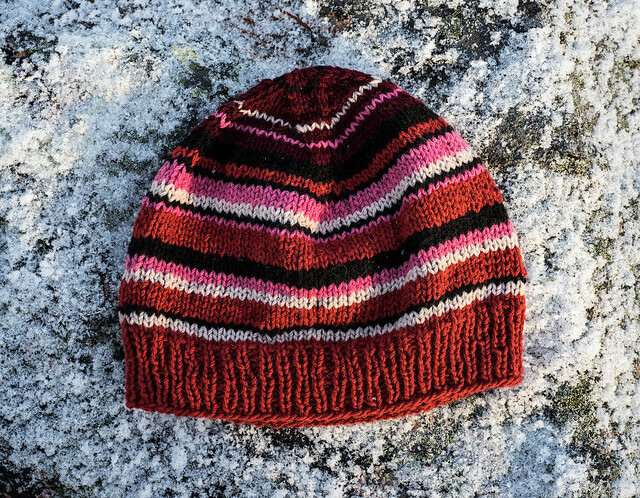 So, the yarn has a possible Swedish link, the pattern is Norwegian and the knitter is Finnish. Hurrah for Scandinavian co-operation! Anyway, I digress again. 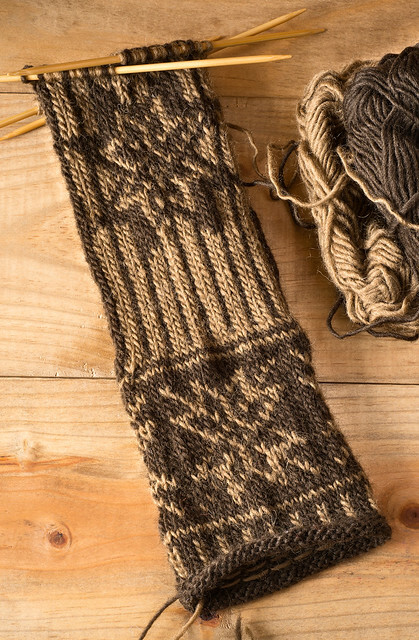 The pattern is very nice to knit and it makes a rather long pair of mittens, which is good on these latitudes, as I don’t like cold wrists. Two shades of brown is actually quite nice, even though I almost never make or buy or wear anything brown. 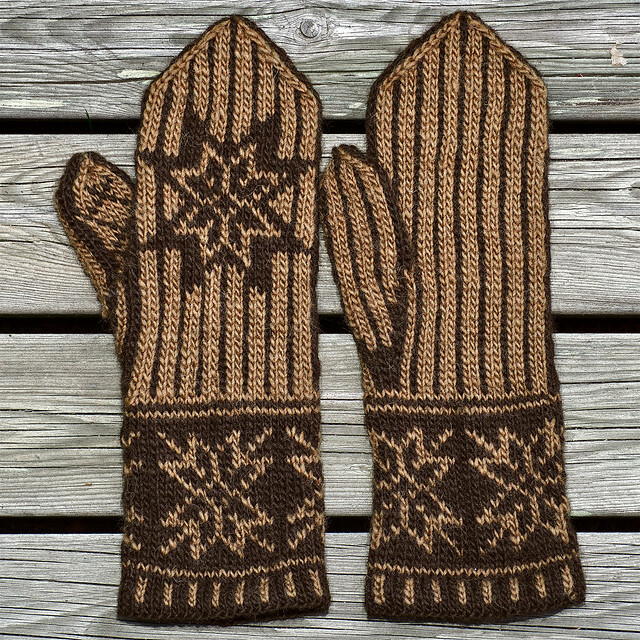 These mittens look like dark and milk chocolate to me. Yummy. Hubby asked for gloves. Hubby got gloves! I used a discontinued Finnish Novita’s Florica yarn. Colours were chosen by hubby. 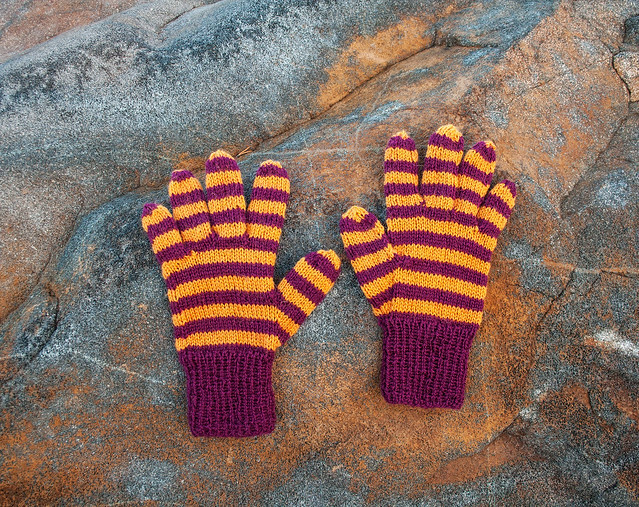 He wanted bright colours so that the gloves are easy to find in the glove drawer even if it’s dark in the hall. He also wanted them snug so that they could easily fit inside a pair of mittens. This is what you have to do up here. The colder it gets, the more layers of clothing you have to pile on, until you look like a Michelin Man. 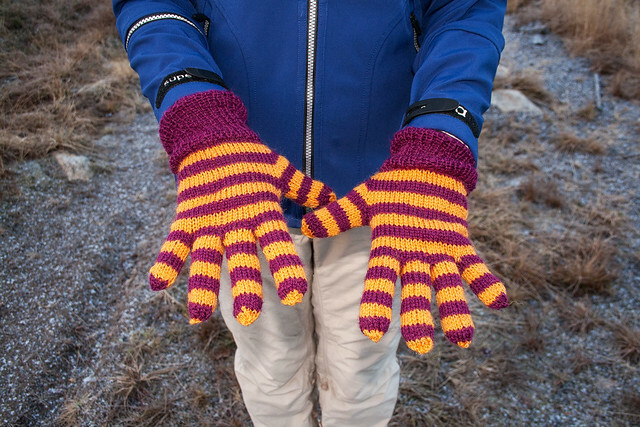 Two pairs of mittens are great but finger gloves and mittens are even better. Another hat. I knitted the scarf years ago – just a simple garter stitch scarf, knitted sideways, every row in a different colour and the yarn ends just knotted for tassels. I’ve used the scarf quite a lot and as I just found small balls of this yarn, I thought that maybe I should have a matching hat, too. The hat is just a simple beanie with no bells and whistles. The yarn is Sirdar Wash ‘n’ Wear Double Crepe DK. I bought the yarn decades ago and for the life of me can’t remember what for. The scarf was knitted with what I had left from whatever it was that I knitted with it in the first place. 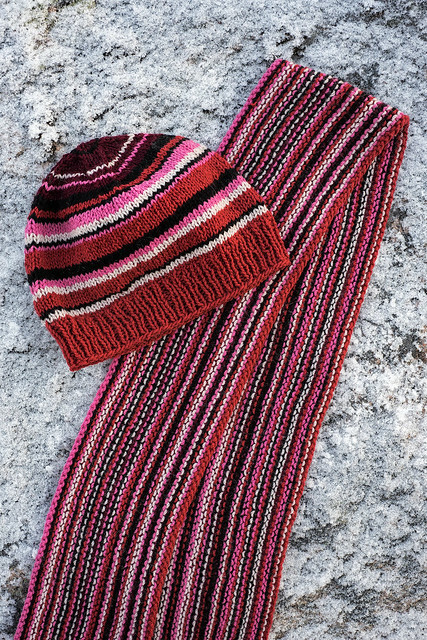 This hat was now knitted with what was left after the scarf. Just random stripes. No pre-planning. Wash ‘n’ Wear Double Crepe DK is apparently the UK’s favourite crepe yarn. I don’t blame them – it’s a very nice yarn to knit. 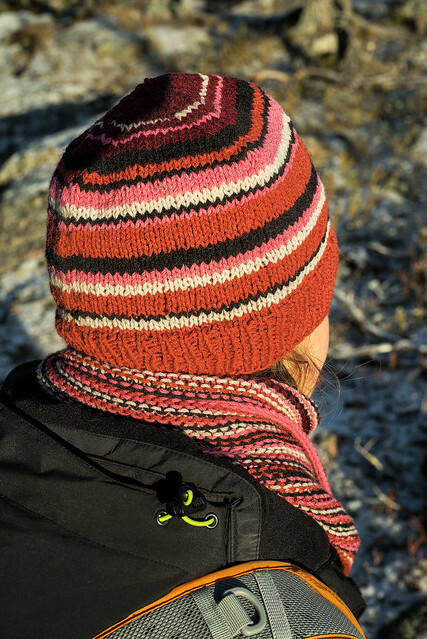 It’s 55% acrylic and 45% nylon and is therefore not a winter hat. Not up in the Arctic anyway, where I am. It does make a good hat for any other time of the year. It’s not itchy (obviously) and it can be machine washed when/if it gets a bit sweaty on your hikes. I started off with 96 st, which turned out to be a little bit too big but I was lazy and didn’t start again. Something like 92 st might have been better. Oh well. I started decreasing when the hat was about 15 cm high. I decreased 8 st. per row until 8 st remained. I do like to use up odd balls of yarn. 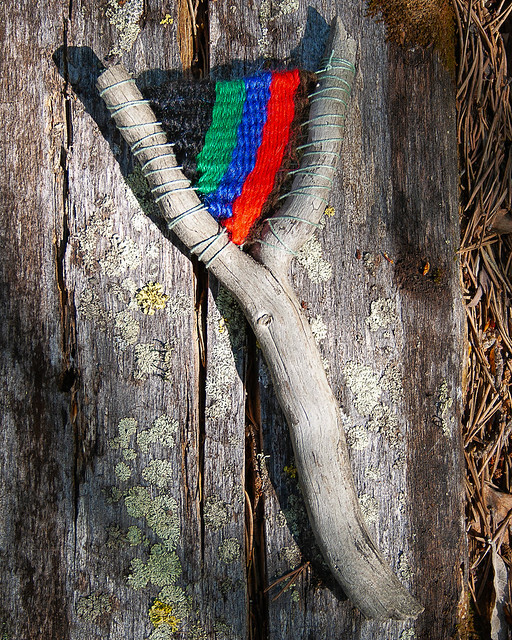 Lately I’ve become interested in weaving. I have some small looms now but my very first attempts were made on DIY looms – cardboard and twigs. This was my very first branch weave attempt. I found the branch while walking in the woods. It’s a perfect Y-shape and it’s thick but small. Training wheels of the weaving kind, if you like. Also, I thought that weaving could be a great stash busting activity. Can’t say that this particular weave busted much of my stash but it got rid of very small amounts of yarn; short lengths of just a meter or two, which are too short for almost anything else. But the main thing is, I enjoyed doing this!